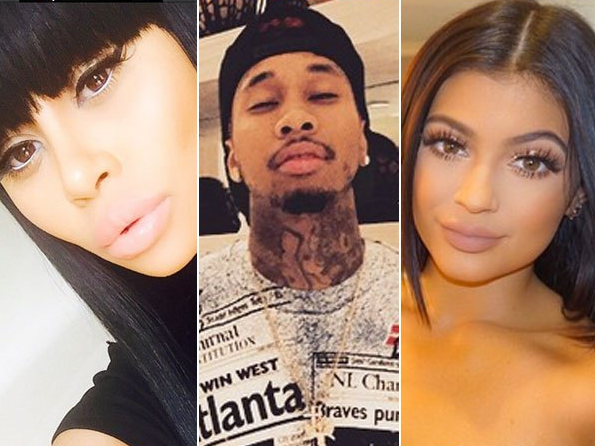 Celebrity Gossip and Entertainment News: Tyga Sneaks Blac Chyna Into Kylie Jenner's House? Tyga Sneaks Blac Chyna Into Kylie Jenner's House? Rapper Tyga sneaks his ex Blac Chyna into Kylie Jenner's house to see their son's room. Oooh snap! Blac Chyna loved sneaking into Kylie Jenner’s new home with Tyga, and had a complete ‘field day’ throwing shade at Kylie’s ‘taste’ — or in her eyes, lack of it! HollywoodLife.com has the EXCLUSIVE scoop on what went down! The biggest disses are the ones behind your back. When Blac Chyna, 27, demanded to see Kylie Jenner’s, 17, mansion Tyga, 25, gave her the tour — without Kylie’s knowledge! While most of us would be fawning over Kylizzle’s exquisite new home, Blac Chyna didn’t exactly take a liking to Kylie’s style — and had a blast slamming it. Here’s how she reacted! Tyga and Blac snuck into Kylie’s home behind her back after she demanded to see it — and “Blac had a field day inside the house,” an insider tells HollywoodLife.com EXCLUSIVELY. “She walked through every single room critiquing the place, mostly saying s–t like ‘that’s ugly’ and ‘this girl has no taste,'” Well, at least that’s not her harshest dig at Kylie — but it’s certainly unwelcome seeing as though she totally invaded Kylie’s privacy! There was, however, one thing she approved of in Kylie’s pad, which just so happened to be the room Kylie built for hers and Tyga’s son, King Cairo, 2. “She went into King’s room, looked around and everything was in order and to her standards,” our source continues. “She was actually quite pleased with the house and King’s room and thought it was kid-friendly. But as far as Kylie’s taste, Blac almost threw up at it.” Ouch! So, why exactly did Blac Chyna sneak into Kylie’s house and diss her style? After hearing that Kylie had built a playroom for King, the hip hop model became “nervous” and “worried” about the room, and she demanded that Tyga show her. However, that totally breaks the trust between Kylie and Tyga, and once Kylie finds out, we can imagine she will not exactly be thrilled. “After weeks of Tyga telling Blac ‘no’ and how disrespectful that would be to Kylie, he finally budged,” an insider told us EXCLUSIVELY. “He knew Kylie would be preoccupied with doing things for the ESPYS and he saw that as an opportunity and allowed Blac to come inside when Kylie wasn’t home.” Tsk tsk, Tyga.